Let’s start this week off with a product review, giveaway and discount to an awesome service! I recently received my first box from Send Me Gluten Free. 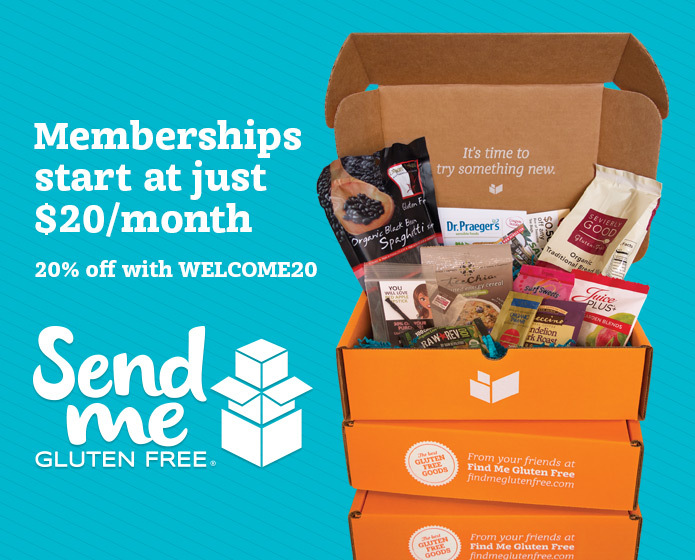 Basically, this is a subscription service that will send gluten free goodies to your door each month! You can sign up for one month or multiple months at a time for a low price. Send Me Gluten Free will ship the monthly box to you. In the box, there are several gluten free products – and each month the products change so you’ll always get to try new stuff. I love the idea of these boxes because it allows people to try different food products, personal care items, supplements, etc. I have become aware of so many great companies through boxes like these. What I also love is the variety of different products – it’s not just food, but other items as well. Plus, the box is delivered straight to your door – no going to the store! I created a little video of me opening the box I received for the January products. Check it out! As you can see, lots of products and coupons! In addition to being gluten free, some of the products in the boxes are soy free, dairy free, etc. If you’d like to know more about the Send Me Gluten Free boxes – click this link! Be sure to enter the discount code to save some money! Now, for the giveaway!!!! Send Me Gluten Free is sponsoring a giveaway in which ONE winner will receive ONE Send Me Gluten Free box for FREE! All you need to do to enter is to leave a comment on this post letting me know why you want to win!! It’s simple, easy and you get FREE products!!! Enter now! To earn a bonus entry: subscribe to my emails here! Again, if you are living a gluten free lifestyle (or wanting to start), I suggest checking out Send Me Gluten Freeso you can learn about new products, companies and services. Click here for more info! I want to win so I can try a variety of gluten and dairy free products before buying them. Thanks for entering! I’m also dairy free. Sometimes I review products and let readers know about new products, deals, coupons, etc. If interested, sign up for my weekly emails here! Best of luck to you on your new journey! It’s challenging but worthwhile all at the same time! I’ll pick a winner in a few days but if you don’t win – check back often as I love giving away goodies!